I can take that puppy baby Thorn, not so sure about the whole pack!!! Sable the black Doggie loves us…Whew, good thing , don’t cha know! 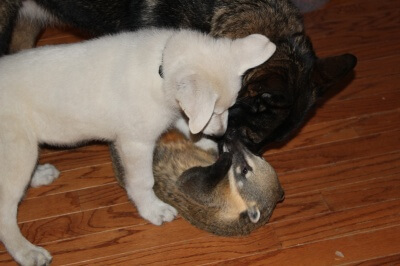 You can bet your favorite treat I get my share of nibbles in…..plus I can count on my coati partner in crime, Lucky to sneak up on them and munch on their back legs..
And that’s how to take down a doggie…..